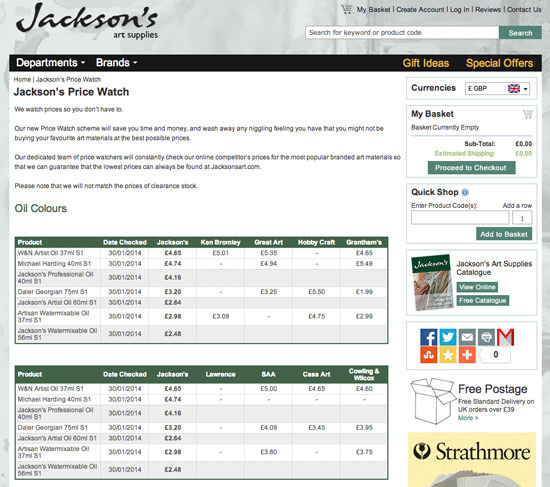 Jackson's Art Pricewatch Scheme is the sort of marketing effort by art supplies companies which impresses me. I'm a committed buyer of goods from John Lewis and one of the reasons I do is because they promise to match the price of the same goods on sale somewhere else so that they always offer the lowest price on normal (ie not clearance) stock. A commitment from art supplies companies to introduce a price watch comparison service has been long overdue. The Jacksons scheme is not perfect. 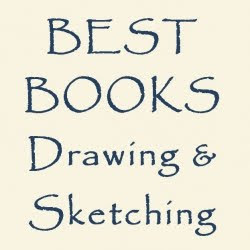 They've picked popular products and very reasonably have matched it against "competitor websites chosen on the first search results for the term ‘art supplies’ on Google.co.uk"
Which means it doesn't cover every product and it doesn't cover every competitor - but it's a start. It could also mean that art supplies companies start to look very carefully at the price they're charging and introduce a bit more competition into the marketplace. However, one might be forgiven for not being aware that the system actually exists. They don't exactly shout about it on the front page of their website! In fact, it's new and if I hadn't read their 24th January blog post Price Watch scheme I wouldn't have known anything about it. To my mind, the quality of this scheme will depend on reliable reporting and updating of prices across the board. I could imagine other art suppliers becoming very annoyed and even litigious if their prices are misrepresented in anyway - that's if the Trading Standards people don't get there first! My conclusion is that it's good to see somebody trying this approach - let's see how it works in practice before arriving at any conclusions about the scheme as a whole. My normal caution to individual artists when comparing prices for art materials is 'ALWAYS look at the cost of shipping' because of the scope for suppliers to balance losses on cutprice goods with premiums on shipping costs. I've certainly spotted suppliers in the past who have operated according to this strategy. In this instance I note Jackson's Shipping Information indicates all shipping - at UK standard postage rates - is free once you've topped £39. The usual sort of premiums apply to the Islands and Ireland.